Click the File tab to switch to Backstage View and then choose the Open command. Both options take you to the Open screen in Backstage View, as shown here. From here, you can select a file from a list of recently opened presentations. Or, you can open a file that you have saved to your OneDrive account. Opening a file in Backstage View. To browse your computer for a file, double-click This PC. This brings up a standard Open dialog box, as shown. The Open dialog box has controls that enable you to rummage through the various folders on your hard drive in search of your files. If you know how to open a file in any Windows application, you know how to do it in PowerPoint (because the Open dialog box is pretty much the same in any Windows program). If you seem to have lost a file, rummage around in different folders to see whether you can find it. Perhaps you saved a file in the wrong folder by accident. Also, check the spelling of the filename. Maybe your fingers weren’t on the home row when you typed the filename, so instead of Shakespeare1.pptx, you saved the file as Djslrd[rstr2.pptx. I hate it when that happens. The fastest way to open a file from the Open dialog box is to double-click the file. This spares you from having to click the file once and then click OK. Double-clicking also exercises the fast-twitch muscles in your index finger. 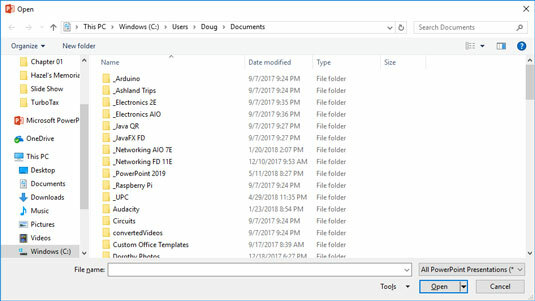 PowerPoint keeps track of the files you’ve recently opened and displays them on the File menu. To open a file that you recently opened, click the File tab, select Recent in Backstage View, and then inspect the list of files on the right side of the menu. If the file that you want is in the list, click it to open it. Having finished and saved your presentation, you have come to the time to close it. Closing a presentation is kind of like gathering your papers, putting them neatly in a file folder, and returning the folder to its proper file drawer. The presentation disappears from your computer screen. Don’t worry: It’s tucked safely away on your hard drive where you can get to it later if you need to. To close a file, click the Close button that appears at the top right of the PowerPoint window. Alternatively, you can click the File tab and then choose Close, or use the keyboard shortcut Ctrl+W. But clicking the Close button is the easiest way to close a file. 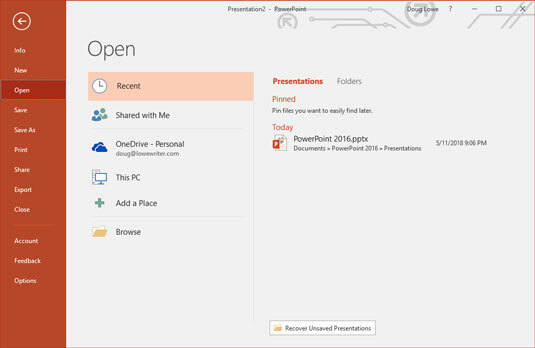 You don’t have to close a file before exiting PowerPoint. If you exit PowerPoint without closing a file, PowerPoint graciously closes the file for you. The only reason that you might want to close a file is that you want to work on a different file and you don’t want to keep both files open at the same time. If you’ve made changes since the last time you saved the file, PowerPoint offers to save the changes for you. Click Save to save the file before closing or click Don’t Save to abandon any changes that you’ve made to the file. If you close all the open PowerPoint presentations, you might discover that most of the PowerPoint commands have been rendered useless. (They are grayed on the menu.) Fear not. If you open a presentation or create a new one, the commands return to life.